This report shows us which were the best-selling colors for a sales period defined by the user. The sales of each color are aggregated across styles and departments giving us a total figure. The colors are grouped from most sold to least sold. For each color, we also see what percentage of the total they represent. In the example shown below, 39 items with a Camel color were sold in the period, representing 10.7% of total sales. The report also includes aggregate stock levels for each color and their proportional share of the total. For example, the report tells us that there are currently 111 items in stock with a Camel color, representing 4.9% of our total inventory. 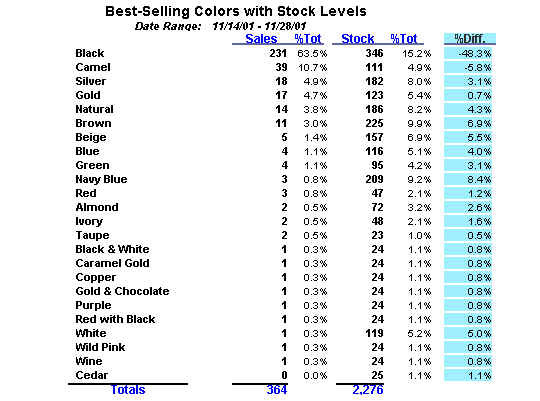 There is another column that shows us the percentage difference between a color's sales and a its stock levels. To continue with our example, the color Camel represents 10.7% of our sales but only 4.9% of our stock, a difference of -5.8%. This suggests that we are understocked in this color. The goal is to bring the percentage difference between sales and stock as close to zero as possible, so that we only carry inventory that we know will sell. This report helps us monitor how well we are doing against this goal.